Answer: No worries. This is just the normal progression of changing seasons. The Autumnal Equinox happened last month, and the times of sunrise and sunset change most rapidly near an Equinox. That’s when the increasing difference between hours of daylight and hours of darkness starts to become easily noticeable. First, a little terminology. The path the Sun takes through the sky is known as the ecliptic. It’s the blue arcs you see in the graphic above. That arc shifts from season to season, placing the Sun highest in the sky during the Summer and lowest in the Winter. The graphic shows ecliptic positions for mid-latitudes (45°) in the northern hemisphere. The ecliptic positions you observe will depend on your latitude. The Sun moves along the ecliptic with a nearly constant speed of 15°/hour. Hence, on an Equinox, when 180° of ecliptic are visible, day and night last exactly 12 hours. Further, the Sun rises exactly in the East and sets exactly in the West. Well … not exactly, but close enough for our purposes. In the Winter, less than 180° of ecliptic are visible, so daylight lasts less than 12 hours. In Summer, the opposite occurs. The two Solstices mark the extreme annual positions of the ecliptic. They occur on June 20 or 21 and December 21 or 22. Which of those two dates applies, changes from year to year. 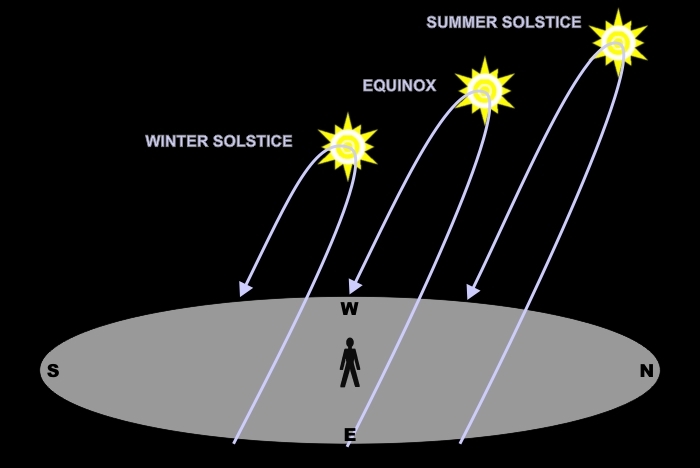 There are two Equinoxes midway between the Solstices. September 22 or 23 is the Autumnal (Fall) Equinox, and March 20 or 21 brings the Vernal (Spring) Equinox. To understand why the ecliptic shifts around like this, we’ll need to change our frame of reference. The above graphic shows the geocentric (Earth-based) frame. Instead, we’ll need to see this motion from the heliocentric (Sun-based) frame.